In our latest case study, TransformEd describes how California’s CORE Districts created a groundbreaking data system that sees students as whole people, not just test scores. 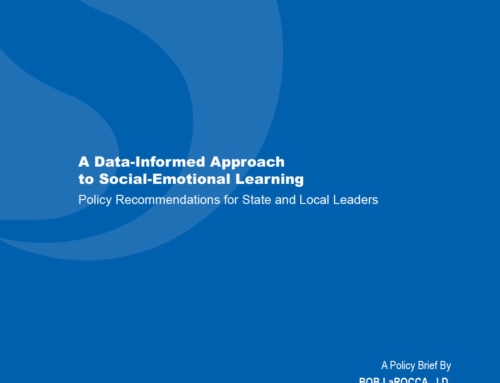 The case study provides an in-depth discussion of how social-emotional competencies—a key component of the CORE Districts—were prioritized and assessed. We conclude with lessons learned about the CORE Districts’ innovative system that can inform other next-generation assessment and continuous improvement efforts, including those catalyzed by ESSA. How have Mindsets, Essential Skills, and Habits (MESH) been operationalized in practice? How can education leaders prioritize a set of MESH competencies and incorporate those into an expanded definition of student success? Are there valid and reliable measures of MESH that districts and states can use to assess students’ development of these skills? What can educators do with MESH data once they have it? Embedded throughout the case study, and also accessible below, are links to select tools that states and districts may use to learn from, adapt, or replicate components of the CORE Districts’ approach. With these simple tools, we seek to provide insight into individual pieces of the complex, multi-year undertaking of the CORE Districts and to highlight key elements of their work that may translate to other education systems. How can you use this case study? The CORE Districts’ work occurred under unique circumstances, and it required extensive collaboration with stakeholders. This paper should be read as a helpful resource for states and districts as they consider whether and how to measure MESH, but we do not recommend using the case study as a how-to guide for the creation of an accountability system. At this point, TransformEd recommends using MESH data for formative purposes (e.g., as part of a needs assessment to support school improvement efforts) instead of incorporating these data into a formal accountability system. Please see our policy brief on ESSA and MESH for more detailed analysis and recommendations.